Janae kissing Darren at the garage. Angus telling Rachel it has to end. Rachel returning to Angus's Flat, kissing him. The dance party – the roof collapsing. Declan and Bridget ducking as the roof falls in. Okay, maybe that's a simile too far. Either way, Riley is calling for Didge, with Elle clinging onto his back like a rotten limpet. He tells Elle to leave, and she eventually extracts herself long enough for him to get away. Kirsten watches with evil delight as Janae and Darren kiss. Janae pulls away and freaks out – she's an idiot, and she loves Ned so, so much, and she's a hypocrite and...BREATHE, woman. Darren says that no-one needs to know about this, but Janae thinks she has to tell Ned. Of course, Darren doesn't want her to, or Libby will know that he's a real rat. And Janae finally agrees. She leaves, and Darren says he'll lock up. Outside, Janae sees Kirsten walking away in a pair of heels that make you wish her to fall over. Preferably into a very, very, very deep hole. Janae is mortified. A dog barks in the background. Random, but there it is. Crying, Didge is desperately trying to pull Josh free from the metal bars that have knocked him to the ground. Declan comes to help, and lifts the bars so that Didge can pull Josh free. Didge is beside herself, but manages to pull Josh away. Declan grabs him, despite Josh's protests that he's too heavy, and pulls Didge's boyfriend onto his own back to get him out of danger. Whilst Declan is taking Josh away, Didge returns to help another unknown extra who doesn't look too delighted to be covered in grey dust. Declan hands Josh to some other guys, and runs back for Bridget. Screaming, more kids run chaotically around, many in circles, if you look closely. Jess freezes, panicking, and Ringo promises to get her out. As they run, more roof collapses and Jess screams; no more running in circles for her, methinks. Rachel and Angus settle on his sofa – one presumes they were just in the bedroom. They banter and flirt and kiss, and Rachel wants reassurance that this isn't just one night – there's more to them than that. Angus agrees, but says that they'll have to be careful. He's no longer her teacher but they have to keep things quiet between them until she's eighteen. Rachel reminds him that age is just a number – it doesn't mean anything. ...the next scene. Where Rachel stands outside the cinema, on the phone wondering where the others are. There's no answer. Frazer appears from nowhere, and asks Rach where the others are. She says that they're inside, but she lies badly, and Frazer knows something's up. Rachel says she doesn't know where everyone is. RACHEL: I left the party early. Becca pushes the coffee plunger down. Unhappily. She tells Paul she's really worried about Declan, even though she knows where he is and who he's with. But she's a mother, and she worries about him. She says she feels strange and she'll feel better when Declan's home. Still in the early hours of the morning, Karl is wrapping Susan's present at the table. Susan comes out the bedroom in her nightwear. Karl quickly hides Susan's present, but she reminds that she was with him when he bought it – it's a foot spa. KARL: I might have bought you something else. Susan puts the kettle on, pretending not to be worried about the kids, and mocks Karl's colour coding on his Christmas wrapping. The radio suddenly turns up the volume on its own, and the Kennedys hear about Warehouse roof collapse. In some clever storylining manoeuvre, designed to rack up the tension and create an ironic series of ringing bells, Karl and Susan state how awful the whole thing is. Karl points out that he might get called into the hospital. And to add to the tension even more, Rachel comes home with Frazer. Susan asks after Zeke. FRAZER: Would you like to do the honours? RACHEL: Erm...we didn't really go to the movies. We went to the Eclipse dance party. Rachel panics, and says that EVERYONE was at the party. Susan is aghast. Aghast, I say! Karl rushes off to get dressed (obviously he needs to get undressed first as he's wearing pyjamas). Rachel says that Zeke had been to a party before, and Karl rushes back out of the bedroom, which is the quickest dressing in history – until I realise that he hasn't gotten either dressed or undressed – he's wearing exactly the same attire. Libby confesses that she had busted Zeke going to the previous party and Susan's furious. Susan says she has to call EVERYONE. And then we get a shot of Rachel who is wild-haired (bed hair) and wide-eyed. If you hadn't watched the story up to this point you'd be forgiven for wondering if she'd just stuck her hand in an electric socket. Oooh, the drama is so TENSE! Ned is pouring the kettle. Janae returns home, tearful, and tells Ned she was at the garage. He apologises for considering buying the house without her, and agrees that they're a family; they should do these things together. She tries to tell him about Darren, but the phone rings. The tension racks up yet another notch – but it's not Kirsten, it's Susan who has news for the Parkers – both of whom have conveniently woken up and are wide awake enough to take the call. Do you know, this warehouse could literally just be the plane, rearranged into different metal structures. Didge is crying on the floor, under one of the metal posts, and Declan sits next to her, trying to comfort her. She's concerned that Josh made it out, and Declan promises her he did. The ceiling creaks ominously and Didge wonders if it will give way when, as if on cue, more polystyrene bricks tumble down. Declan cradles Bridget so that she won't be hit. In the hallway, Karl is now dressed and asks Libby if there's anything else he needs to know about the party. Libby can't remember anything else. She knows Rachel wasn't involved, though, and wishes she'd have said something. Karl admits that Zeke probably would have lied anyway. In the lounge, the residents are gathered: Paul, Becca, Miranda, Steve, Rosie and Rachel. Susan says that there's no mention of survivors on the news – all they know from Rachel is that their kids were there. Steve lays into Rachel and Susan defends her daughter; Steve agrees it wasn't her fault – it was Zeke who lied. Karl is quick to point out that all the kids lied, including Bridget. Rosie tells everyone not to lay blame, and the adults along with Rachel set off to Warehouse. Which just happens to be the next scene. Coincidence? I think not. Ringo is lying under some sort of concrete structure, but can't move it out of the way. He also appears to be lying on a lot of crinkled tin foil. He calls out for someone to answer him. Jess finally responds – she's lying right next to him but they can't see each other due to yet another metal structure being in the way. Jess tells him that she can't move; she's stuck under “stuff.” She wishes she could see Ringo, but she can't. She manages to squeeze her hand through a gap and he takes her hand in his. He promises her it will all be okay. The roof creaks ominously again and someone plays the piano sombrely in the background to let us know that it's all going wrong. In another part of Warehouse, alongside yet another metal structure, Riley comes to, and sees Elle who is unconscious; he tries to wake her, shaking her, and calls for help. Outside Warehouse there are ambulances and fire crews, although I imagine the latter came in fire engines and that there are some paramedics around somewhere. There are lots of dust-covered teenagers wandering around. 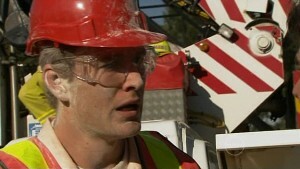 Frazer is first to arrive, and sees Fitzy who apparently moonlights as a fireman / rescue person. Fitzy lets Karl through to help the Dust Covered Ones, whilst Janae receives a text from Kirsten who wants to talk to her. She tells Ned it was her mother. Josh sees Rachel and calls to her. Miranda demands to know if he's seen Bridget, and Rachel wants to know if he saw anyone else – Zeke, or Ringo? The paramedics bring a young boy out with dark hair. Susan's been taking projection lessons from Ben as she YELLS “it's not Zeke” – quite why, I'm not sure, as she's standing next to everyone. Fitzy won't let Steve in to help with the search; and whilst he's distracted, Libby ducks under the tape and runs into the building. Susan screams after her, then screams at Karl to get Libby out. Declan and Bridget still wait with the ominous plane crash lights. Didge wonders how long it will take for people to find them, and Declan reckons a few days. What?! He references the Aussie miners who were rescued earlier last year. They wonder if they'll be famous. Didge tells him he was really brave to rescue Josh before and to come back for her, but Dec doesn't think it was. She wants him to accept the compliment but he won't. Instead, he tries to have The Conversation, but she tells him she can't handle it right now. Elsewhere, Jess and Ringo are still stuck. She hopes that Taylah got out okay, and Ringo reminds her that Zeke was with her, so they'll be alright. Jess adds that her mum will kill her. JESS: Last time I was out all night, I got the whole “I'm so disappointed in you” speech. RINGO: Tell me about it. JESS: I don't want to be a disappointment. Ringo tries to comfort her, and Jess wonders what if no-one finds them in time. RINGO: We are going to get out. RINGO: They're just digging through stuff, okay? They're coming. Elsewhere again, Elle regains consciousness, but can't breathe properly – Riley (who's apparently a doctor now, too) thinks that Elle has broken her ribs, and advises her to stay still. Under the glare of the blue lights, Elle falls unconscious again. Karl tells Libby to go back – he won't have two of his kids in danger. Libby starts to go back, and Karl aims for Zeke. But Lib sees something that Karl doesn't, and calls for her dad to get out, but it's too late...Libby is crushed by another fall, and Zeke calls desperately at Karl not to leave him. But the ceiling caves in once more, and Karl is buried along with his daughter. Everyone waits, nervously. Darren arrives, and Susan tells him that Karl and Libby are in there. There's another massive collapse, and the residents all cower as more of the structure falls down. Darren tries to get through the police tape, but is stopped. Some firemen run out, with a couple of other kids. Fitzy helpfully tells Paul that there's been another collapse and it will be a couple of hours before they can go back in. 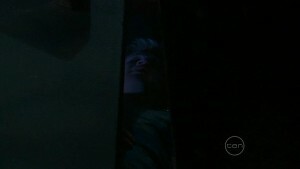 The scene ends with the camera on Susan, staring at Warehouse.